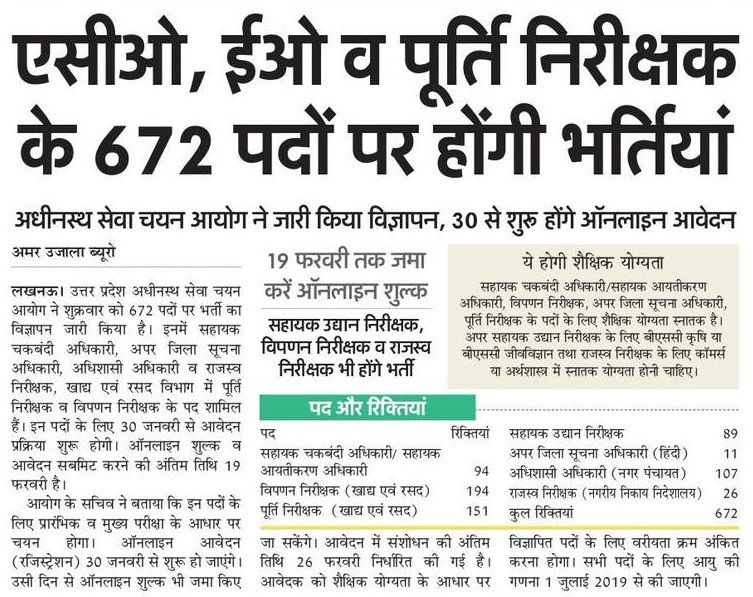 UPSSSC Marketing Inspector Recruitment 2019 Apply Online for UP SSSC Chakbandi Adhikari EO Vacancy UPSSSC UPSSSC 672 Marketing Inspector Recruitment 2019 Bharti Latest News UPSSSC Supply Inspector Latest Jobs for Graduate Pass and other vacancies check below. UPSSSC 672 Marketing Inspector Recruitment 2019 From 30th January 2019 waiters of UPSSSC vacancies may apply online for 672 Marking Inspector, Chakbandi Adhikari, EO (Adhishasi Adhikari), Supply Inspector in Khad and Rasad Vibhag of Uttar Pradesh. UPSSSC Chakbandi Adhikari Recruitment 2019: The partner of UPSSSC 94 Chakbandi Adhikari, 151 Supply Inspector, 28 Revenue Inspector Beginning from 30 The January 2019. 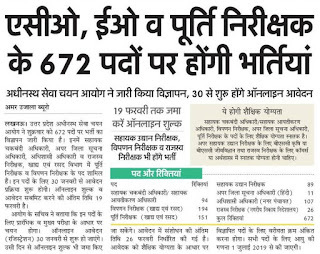 You have a time left to apply online for any UPSSSC 672 EO Recruitment is 19 days only. Educational Qualification: Bachelor Degree in any stream. You may also check post wise qualification. General obc: rs 225, sc st 105, ph divyang rs 25 posts, pay the exam fees through debit card only.